The third ingredient in “Beyond the Plateau - Six Ingredients for Profitability & Growth” is Alignment. 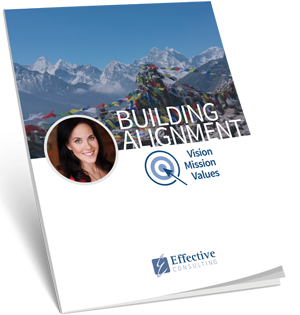 It is important for teams to be aligned around vision, mission and core values. We ensure that your team collaborates to develop and buy into a clear vision and direction for your organization. All future decisions can be measured against your vision and mission. Our Alignment Package systematically helps you and your team build a clear set of core values, vision, and a mission to guide your company's direction and serve as a tool to keep all team members empowered and moving in the same direction. Many business owners and their teams are fantastic at what they do, but they get so busy servicing their clients, that the business itself gets stuck. They may have tons of great ideas, but not the time, systems, or resources to implement anything new, so the business hits a plateau. Aligning the team around core values and a vision and mission that they have helped create and are fully engaged with, keeps everyone moving in the same direction.